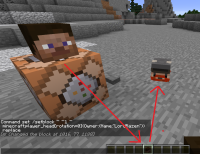 If you use this command in vanilla Minecraft and activate it, a steve head is shown. If you pick the head with the ctrl + middle mouse key in gamemode 1 you get the head in the inventory, but it's still Steve. If you play this head down again, it's finally the correct player head - but the texture should be shown after setblock or after the picking, too. If you use this command, you get a Steve head named "Dwarf" in your inventory - only if you place it the texture is finally shown.